800mm wide bathroom radiator with upper towel bar. Steel Column radiator insert with chrome frame. Perfect for saving space. Made in Europe with a 10 year guarantee. Exceptional build quality bathroom radiator and upper towel bar. 800mm wide, 952mm tall and135mm deep. 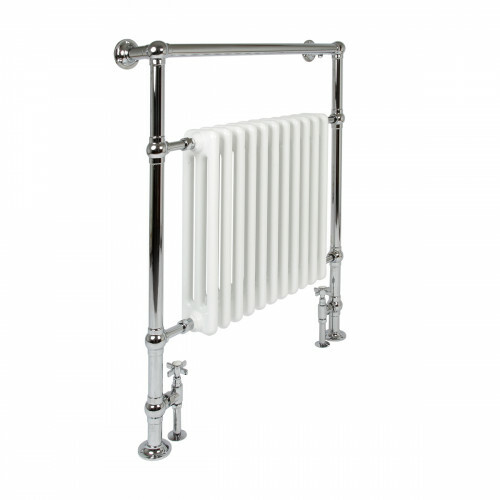 Chrome plated frame with white steel radiator. Made in Europe to ISO 9001:2008 and EN442. Pair with All Chrome TRV valves for self-regulated heating or manual Chrome Angled Crosshead valves. Add Chrome shrouds and base plates to cover the copper pipe for that finishing touch.